Welcome to our August ARTISTE Blog Hop! Each month we will showcase a feature of the amazing ARTISTE Cricut cartridge which can be purchased exclusively through a Close to My Heart Independent Consultant. We're so excited to be doing this hop and we have a fabulous lineup with some very talented ladies. There will be lots of fun projects AND some blog candy!!! This month we will be showcasing a different page from the Artiste cartridge! Did you know there were 700 images on this cartridge?? That's right -- 700!!! If you just happened to come to this blog, you should start at the beginning at Lucy's blog - http://www.love2createitall.com. This cute little box from page 39. The great thing about making 3D items with the Artiste cartridge, is that this cartridge comes with a booklet to show you how to put the items together! I folded the box according to the directions, and it was pretty easy! 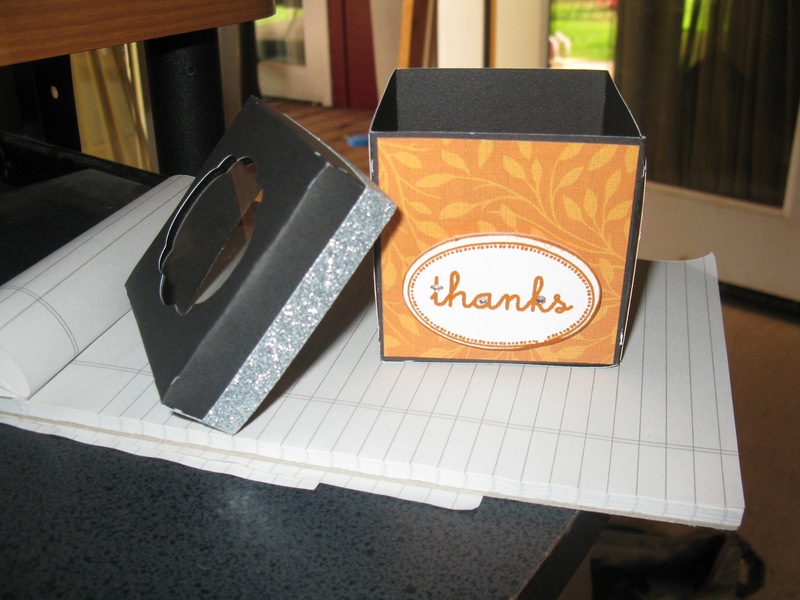 I cut the flirty paper just a smidge smaller than the side of the box so a little black would show up. The Thanks is stamped on a piece of chipboard that comes in the Artiste Collection. The chipboard piece was in the shape of a quote bubble and I just cut off the tail to make it round. I also inked the edges and stamped the sentiment in Sunset. For the lid I used the Silver Shimmer Trim. The neat thing about the trim is that it has a sticky back! In the cut out in the lid I cut a 2x2 square of clear acrylic (found at my local craft store. comes in a 12x12 pack) so that I could put goodies in the box with out them falling out. Thanks so much for stopping by and hopping with us - we hope you LOVE all the projects we created! What a great box!! That project has inspired me to try more boxes and Artiste is full of cute ones! Your box is so cute! I like the see thru window at the top f the box. Great job.